I’m from Sumter, South Carolina, born and raised. My father dropped out of high school in 10th grade and worked as a supervisor at a carpentry local business. My mom had finished high school, but didn’t have an advanced degree. She worked at a nearby food processing plant. I have five siblings in total and school was somewhat of a priority for our family. Making good grades was important, but we didn’t have anyone at home to help with schoolwork. Coming from a working class family, the impression I got growing up was that my siblings and I were expected to stay within that socioeconomic bracket as well. There were a lot of manufacturing plants in the area and my brother and I were expected to go that route, like my dad did. When I was twelve my dad died and so by the time I graduated high school I was working full time at tool manufacturing plant. What was your high school experience like/was college something you thought about doing? I wasn’t a problem child, I made decent grades, but college, like I mentioned earlier, wasn’t necessarily on the horizon. After I graduated high school, a lot of people began asking me about my plans and I really dreaded that question. I enrolled at a two-year technical college. I was interested in medicine because I wanted to help people, but I wasn’t particularly gifted at math or science so I switched my focus to computer science, but that didn’t last long either. My classmates and I would go to the mall, skip class, I really wasn’t focused enough for college. I went to school in the mornings and continued working in the evenings, but school wasn’t my priority and I was put on academic probation and eventually suspended from technical college because of all my absences. In my mind, college had become something that I just couldn’t achieve. Can you talk a little bit more about technical college as an alternative to other institutions of higher learning? As a current educator, I promote any kind of educational advancement for students. Two-year colleges are great options for students who are looking to save money. I will say, make sure that the courses you take will transfer to whatever institution you go to next. A two-year college gives you a taste of the college experience and prepares you for a four-year institution. There are plenty of job opportunities for students with associates degrees. There’s a lot of literature that talks about how the push to go to four-year universities is leaving a gap in the workforce. There are technical jobs that are well paid and don’t require a four year degree. Even for students who don’t see themselves pursuing higher education, I still encourage them to try something like technical college. 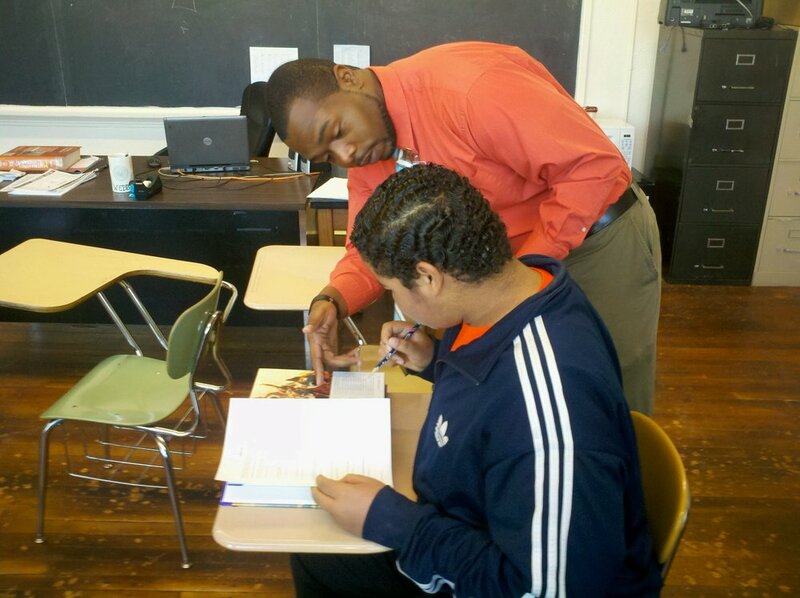 James working with one of his high school students. What made you want to go back and pursue a college degree? I started dating someone whose mom I worked with at a manufacturing plant. My partner had a son and I knew that once we got engaged I’d be in the role of a father. I always envisioned telling my kids to go to college, but I didn’t want to say that without having been to college myself; I wanted to be a role model for them. At that time I‘d just started working again after my second layoff and my fiancé was working on her master’s at a university in Tennessee. She kept encouraging me to apply and we made a deal that if I got in I’d go and if not we wouldn’t talk about it again. I thought for sure I wouldn’t get in. Then I got my acceptance letter and I was shocked, I even called them to confirm. I had to quit my job and prepare to leave home. I’d never been too far out of my hometown, but I took a chance and decided to see where this road would take me. I drove four hours to East Tennessee State and that was the beginning of everything—I was 23 at the time. What advice would you give to someone who is feeling much the same way you were—ambivalent about making a huge change and unsure of what benefits a college education can afford? I would encourage students to do a cost-benefit analysis and get to the root of what’s holding you back. What are your real reasons for saying no? Other than fear. If fear is one of those obstacles, that can be hurdled. There will always be the fear of the unknown, but that changes as you go along and get more comfortable in your new environment. Once you got to campus, what was your college experience like? I was a commuter the whole four years, meaning I didn’t live on campus. Orientation was really scary, I didn’t know anyone, I didn’t even know what orientation was. The school had tables and booths set up and I was walking through this set-up feeling out of place and not really enthusiastic about talking to anyone—it was basically, “I don’t want to talk to you, I don’t know any of you, no, I won’t sign that.” It was a completely new experience for me. For some reason, I knew I didn’t want to come in as an undeclared major—there’s nothing wrong with that, but I felt like I should have one picked out. I was choosing between history and psychology and chose history because I had a great history teacher in high school and recalling that feeling was the deciding factor for me. I ended up minoring in secondary education. Learning about the intricacies of teaching and the classroom environment was really eye-opening and insightful for me. James and his students at a farmer’s market. How would you encourage students to not only get more involved, but take ownership of this new space and community they’re now a part of? You have to get out of your comfort those and almost “disrupt” yourself. College is a great experience and the classroom can teach a lot, but you can get as much instruction outside of the classroom, if not more, if you engage with your community. I gained a real appreciation for people just from interacting with different students across my campus. For example, I’d never interacted with anyone who wasn’t a Christian until college. One of the women I supervised at my job was a Sunni Muslim and learning about her experience and the discrimination she faced made me more empathetic and broadened my horizons. I was able to share in experiences like Ramadan with her and become more aware of the struggles facing people besides myself. You can’t really put a hierarchy on pain and struggle; we’re all going through something. What were you involved with in college outside of class? My first two years I laid low—I went from class to work to my home. I’d gotten introduced to the federal work study program by a classmate and began working on campus. (*Make sure to check if you have federal work-study! *) I wasn’t involved in any activities and I rarely attended events during that time. Then my at the end of my sophomore year I joined the African Diaspora Society, which was a space for our group to come together and discuss issues of critical importance to African Americans in the country. It was important for me to find this group because I often felt out of place as a 23 year-old in classes full of 17 and 18 year-olds and this group helped bridge the gap. However, I still didn’t feel fulfilled in my college experience and so I attended an interest meeting for Alpha Phi Alpha which is the first Greek letter organization for black men founded at Cornell University back in 1906. I went to the interest meeting to see what it was all about; I didn’t really plan on pursuing it further. But they showed interest in me and I went on to become the oldest member they’d initiated in that chapter. I’d always had to be an adult, from a very early age, and being part of this group that was much younger than I helped me tap into a less serious side of myself. Eventually I was voted chapter president. During my tenure we did a lot of community service and fundraising; being in a position of leadership spurred me to join other groups on campus. I was asked to be a part of the race-relations dialogue task force, a group that tried to find solutions to race-related issues on campus. There are some negative stereotypes associated with fraternities and sororities—what advice would you give students who are looking to join Greek life, but are unsure whether it’s a good fit? There are many stereotypes regarding hazing and other such practices and whether they’re true or not really depends on your fraternity/sorority. I will say, if it’s something that you check out and are passionate about, consider joining and work to change that narrative. Within a Greek organization you’re taught leadership skills, time-management skills—there are a lot of positive aspects that don’t get highlighted. Do your research on the background, history, and values of a chapter and then decide if it’s the right fit for you. A lot of your work has been in the educational realm; to what extent is that informed by your own educational trajectory? I was a student teacher for a semester as part of my minor and I really enjoyed the experience. I also worked in a program that helped guide students to college and that gave me a smaller group of students to work with which allowed me to connect with the students more so than I did during student teaching. So in a way, the classes I chose to take in college really drove me to those experiences. What do you do now and is it what you thought you’d be doing? I knew I didn’t want to be in a classroom, but I really wanted to continue working with students. I wanted to make a shift to the college environment, but as I was looking at job descriptions I realized I was going to need to go back and get my Master’s. I decided to do an online Master’s through Abilene Christian University. I did go to Texas for their two-week on-campus residency. By that time I was married and had two kids and got a job working in admissions at ETSU. It wasn’t until I started my Master’s that I began associating myself more with the first-gen label. All throughout undergrad I thought of myself more as an “adult learner”, because I didn’t really know what being a first-generation college student meant. As I read more about first-gen students I began to realize how my experience paralleled to what I was reading—it really resonated with me. James with students at Wofford College during a business etiquette event. What are your plans/goals for the future? I’m currently working on my Doctor of Education. I really enjoy what I’m doing now; I’m working with two programs and I currently teach two first year courses. I’m working directly with first-gen students at Wofford College in South Carolina, a small liberal arts college. Prior to this I didn’t know if I wanted to work primarily with student or academic affairs. I’ve recently decided to continue with academic affairs so that I can keep working with the groups I’m currently working with. I haven’t made it through this journey by myself, there have been so many people who have helped me along the way and I want to help give back. I see myself still working with these groups of students as my career progresses; maybe in the position of director or assistant dean. What do you hope your first-gen students will leave college with? I hope they leave with the understanding that the sky’s the limit. We all make mistakes, but learning from those mistakes and picking yourself up is what matters. As an educator, how would you like to see the conversation around being first-gen develop? You can always find information about what first-gen students are lacking in. But I think it’s important to also recognize their strengths. First-gen students are the most resilient group on a college campus. And I say this because I’ve heard this from staff on campus. I recently talked to someone at career services who was telling me how much he loved working with first-gen students because they had incredible drive. We need to recognize that and that first-gen students are not a monolith. 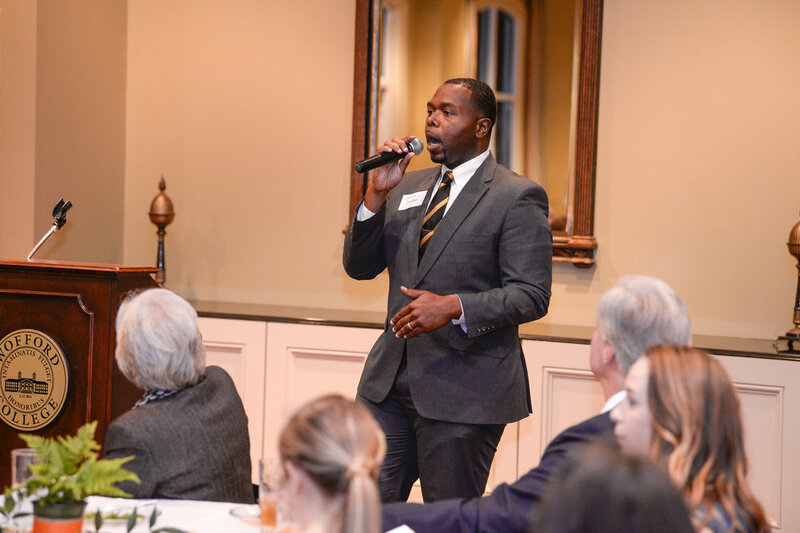 James speaking at a Citizen Scholars event, a scholarship program at Wofford that aligns with the college’s mission to enroll more first-gen students. One thing you wish your 16-year-old-self understood? Personal finance and politics. Favorite place? Charleston, South Carolina. One book recommendation? Letters to a Young Brother by Hill Harper, it’s great regardless of gender. One study tip? Do what works for you—everyone has their own style. And take breaks!! Thanks for sharing, James, and for your commitment to helping students!